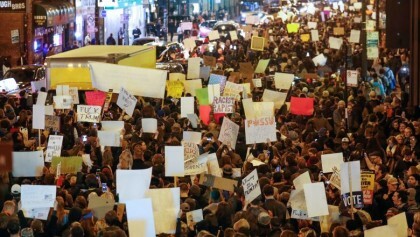 The unprecedented victory of Donald Trump in the U.S presidential elections has sparked off protests across many cities in the United states of America. The protesters in their thousands were seen carrying placards and blasting his campaign rhetoric about immigrants, Muslims and minority groups. In Los Angeles, protesters sat on the 110 and 101 highway interchange, blocking traffic on one of the city’s main arteries as police in riot gear tried to clear them. Some 13 protesters were arrested, a local CBS affiliate reported. An earlier rally and march in Los Angeles drew more than 5,000 people, many of them high school and college students, local media reported. A demonstration of more than 6,000 people blocked traffic in Oakland, California, police said. Protesters threw objects at police in riot gear, burned trash in the middle of an intersection, set off fireworks and smashed storefront windows. Police responded by throwing chemical irritants at the protesters, according to a Reuters witness. Two officers were injured in Oakland and two police squad cars were damaged, Johnna Watson, spokeswoman for the Oakland Police Department told CNN. Chicago police closed roads in the area, impeding the demonstrators’ path. There were no immediate reports of arrests or violence there. In Seattle, police responded to a shooting with multiple victims near the scene of anti-Trump protests. Police said it was unrelated to the demonstrations. Protesters railed against Trump’s campaign pledge to build a wall along the border with Mexico to keep immigrants from entering the United States illegally. Hundreds also gathered in Philadelphia, Boston, and Portland, Oregon, on Wednesday evening. In Austin, the Texas capital, about 400 people marched through the streets, police said. "No Trump! No KKK! No racist USA."